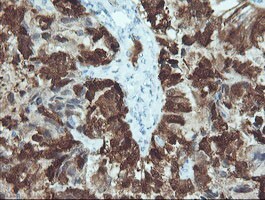 Mouse anti Human CRABP2 OTI10D6. 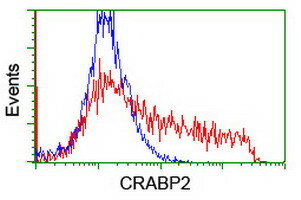 Full length human recombinant protein of human CRABP2 (NP_001869) produced in E.coli. This gene encodes a member of the retinoic acid (RA, a form of vitamin A) binding protein family and lipocalin/cytosolic fatty-acid binding protein family. 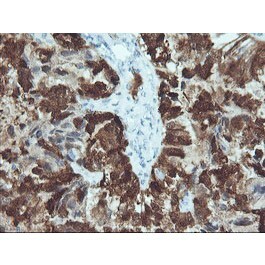 The protein is a cytosol-to-nuclear shuttling protein, which facilitates RA binding to its cogte receptor complex and transfer to the nucleus. It is involved in the retinoid sigling pathway, and is associated with increased circulating low-density lipoprotein cholesterol. 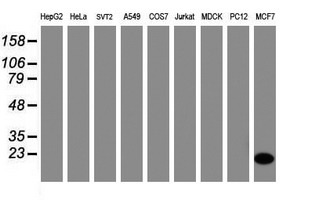 Altertively spliced transcript variants encoding the same protein have been found for this gene.